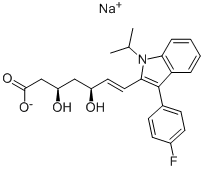 Pitavastatin (NK-104) is a potent HMG-CoA reductase inhibitor, Pitavastatin inhibited cholesterol synthesis from acetic acid with an IC50 of 5.8 nM in a human liver cancer cell line (HepG2). 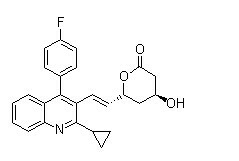 Clinofibrate is a hypelipidemic agent and a HMG-CoA reductase inhibitor. 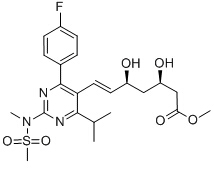 Mevastatin (Compactin; ML236B) inhibits HMGCR (HMG-CoA reductase) (Ki for acid form is 1 nM) which in turn inhibits isoprenoid biosynthesis and therefore blocks protein isoprenylation and reduces plasma cholesterol levels in humans. Pitavastatin Calcium is a competitive inhibitor of the enzyme HMGCR. Alternate studies show that pitavastatin can suppress oxygen production in endothelial cells by inhibiting Nox. In addition, pitavastatin reduces the expression of eNOS mRNA while increasing the NO dependent response stimulated by acetylcholine and the calcium ionophore, A23187. Fluvastatin is an HMGCR (HMG-CoA reductase) inhibitor. Fluvastatin sodium is a competitive inhibitor of hydroxymethylglutaryl-coenzyme A reductase (HMGCR), used to treat hypercholesterolemia and to prevent cardiovascular disease.